1x [ADDON_ACTION_BLOCKED] Аддон 'MythicPlusTimer' пытался вызвать защищенную функцию 'ObjectiveTrackerFrame:Hide()'. 1x [ADDON_ACTION_BLOCKED] AddOn 'MythicPlusTimer' tried to call the protected function 'ObjectiveTrackerFrame:Hide()'. Stack: Frame CmTimer is not movable [C]: ? This is not an error. This is an info that the timer is currenty not movable. Did you do "/mpt toggle" as the command, you should see a grey box which you can drag. Figured it out, I am stupid. I actually typed the whole /mpt toggle: unlock Timer Frame, instead of simply /mpt toggle. Thanks for the help! I could not reproduce this issue, when it the error occure? Would it be possible to add an option to show the *worst* time that completed the key? 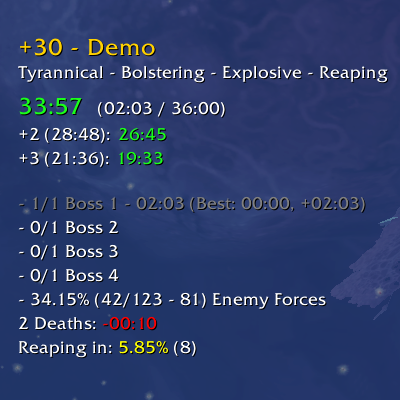 It's useful knowing the best time to compare boss kills, but i feel it's also useful to know the timing of bosses of your worst timed run. Getting this error in the newest version: "12x Error loading MythicPlusTimer\Locales\zhCN-Simplified Chinese.lua". I can not reproduce that error. What did you do as the error occured? Nothing. Is it possible it showed up after updating an addon while in-game? It doesn't pop up this error anymore. Yes, that is very possible. WoW only loads new files on a restart, and the new version contains a new lua file for the zhCN translations. Thanks for reporting it, appreciated. L["DeathCounter"] = "死亡计数器 (限制: 如果死亡过远则不计数)"
Hi, i've a little problem with your add-on... 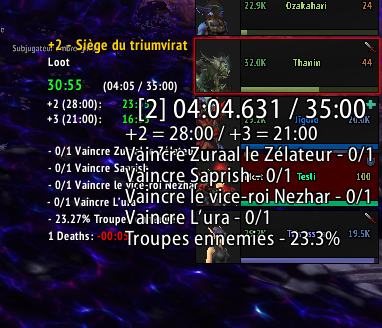 The default timer is always here and i don't know how to remove it :( I use Elvui. Could you add a background to the timer frame? It's sometimes hard to see.